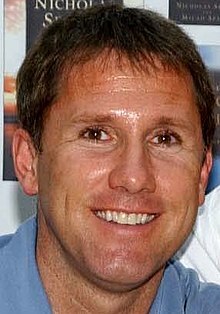 Nicholas Charles Sparks (born December 31, 1965) is an American novelist, screenwriter and producer. I am nothing special; of this I am sure. I am a common man with common thoughts, and I've led a common life. There are no monuments dedicated to me and my name will soon be forgotten, but I've loved another with all my heart and soul, and to me, this has always been enough. "I know we've had our differences, Allie, and that we haven't seen eye to eye on everything. I'm not perfect, but I did the best I could with raising you. I'm your mother and I always will be. That means I'll always love you." Allie was silent for a moment, then: "What should I do?" "I don't know, Allie. That's up to you. But I would think about it. Think about what you really want." "I can't make this decision for you, Allie, this one's all yours. I want you to know, though, that I love you. And I always will. I know that doesn't help, but it's all I can do." I lead a simple life now, I am foolish, an old man in love, a dreamer who dreams of nothing but reading to Allie and holding her whenever I can. I am a sinner with many faults and a man who believes in magic, but I am too old to change and too old to care. I miss you, my darling, as I always do, but today is especially hard because the ocean has been singing to me, and the song is that of our life together. Deanna's voice softened. "Theresa, I know there's a part of you that believes you can change someone, but the reality is that you can't. You can change yourself, and Garrett can change himself, but you can't do it for him." "But you don't," Deanna said, gently cutting her off. "Or if you do, you don't want to see it that way. Your vision, as they say, has become clouded." "Oh, Garrett, who do you think it was that brought the bottle to her?" "It was...the most difficult walk anyone ever had to make. In every way, a walk to remember." "I can no more give Jamie away than I can give away my heart. But what I can do is let another share in the joy that she has always given me." Youth offers the promise of happiness, but life offers the realities of grief. "Even now, not a day goes by when I don't wish I could turn back the clock and change what happened." So many people these days, it seemed, believed that these things (personal fulfillment and self-esteem) could come only from work, not from parenting, and many people believed that having children had nothing to do with raising them. Her mother had once told her that there were men who kept secrets bottled up inside and that it spelled trouble for the women who loved them. "Mitch...was the kind of man who added something to everything he touched and everyone he came in contact with. I was envious of his view on life. He saw it all as a big game, where the only way to win was to be good to other people, to be able to look at yourself in the mirror and like what you see." "Why? Do you want to rescue me, too, Taylor? … That's what you're trying to do, isn't it? … I appreciate what you're trying to do, but it's not what I need right now. I need to handle this my own way." "Loving someone and having them love you back is the most precious thing in the world. It's what made it possible for me to go on..."
The truth of love and if it's near. "I don't want to be a grown-up. … Because grown-ups always say that things are complicated." "If it's over--if it's really over--then don't let it screw up the rest of your life." "No," his father replied, "you ran for you. I just hope you're running toward something, not away from something." "...The greater the love, the greater the tragedy when it's over. Those two elements always go together. … The best we can hope for in life is that it doesn't happen for a long, long time." "When I sleep, I dream of you, and when I wake, I long to hold you in my arms. If anything, our time apart has only made me more certain that I want to spend my nights by your side, and my days with your heart." "And don't worry. From wherever I am, I'll watch out for you. I'll be your guardian angel, sweetheart. You can count on me to keep you safe." Nowadays, she thought, it was the little things in life that mattered. If the highlights in her past set the tone, it was the day-by-day events that now defined who she was. "You know me better than anyone, and you're my best friend. I don't think there's anything you could say to me that would lead me to believe that you're doing it just to hurt me. If there's one thing I've come to know about you, it's that you're not even capable of something like that. Why do you think I like spending time with you so much? Because you're a good guy. A nice guy." "My mom used to tell me that whatever you do, marry someone who loves you more than you love him." She'd always believed that people come in two varieties: those who look out the windshield and those who stare in the rearview mirror. She'd always been the windshield type: Gotta focus on the future, not the past, because that's the only part that's still up for grabs. ...feeling her helplessness. There was nothing worse. Most people lived under the illusion that they were in control of their lives, but that wasn't completely true. Yeah, you could decide what to have for breakfast and what to wear and all those little things, but as soon as you stepped out into the world, you were pretty much at the mercy of everyone else around you, and all you could do was hope that if they were having a bad day, they wouldn't decide to take it out on you. ...when two people live together, the stress flows both ways. This, I come to believe, is both the blessing and the curse of marriage. It's a blessing because there's an outlet for the everyday strains of life; it's a curse because the outlet is someone you care deeply about. "...she would fall in love with me again, just like she had a long time ago. And that's the most wonderful feeling in the world. How many people are ever given that chance? To have someone you love fall in love with you over and over?" He had not only known that I would be coming to see him, I realized, but had anticipated the reason for my visit. And in typical southern fashion, he'd given me the answer to my problem, without my ever having to ask him directly. ...there is the fact that having a child transforms the basic marriage relationship. No longer are you simply husband and wife, you are mother and father as well, and all spontaneity vanishes immediately. No, there's no experience quite like having children, and despite the challenges we once faced, I've considered myself blessed because of the family we created. But love, I've come to understand, is more than three words mumbled before bedtime. Love is sustained by action, a pattern of devotion in the things we do for each other every day. "Marriage is about compromise, it's about doing something for the other person, even when you don't want to." The events of the past year have taught me much about myself, and a few universal truths. I learned, for instance, that while wounds can be inflicted easily upon those we love, it's often much more difficult to heal them. Yet the process of healing those wounds provided the richest experience of my life, leading me to believe that while I've often overestimated what I could accomplish in a day, I had underestimated what I could do in a year. But most of all, I learned that it's possible for two people to fall in love all over again, even when there's been a lifetime of disappointment between them. It isn't easy living with an author. I know this because my wife has informed me of this fact. "Writing is easy. It's just the typing that's hard." My wife, I might add, is a saint. Either that, or maybe she is insane. "Denial is an ugly thing, Nicky." "See what I mean? That's denial." "...the secret of a long lasting marriage is... ...communication. When we talk about issues and really open up to each other, things are great between us. When we keep things to ourselves, grudges and resentments build up and we end up arguing." ..."What good is talking if neither of you are really committed?...marriage comes down to actions. I think people talk too much about the things that bother them, instead of actually doing the little things that keep a marriage strong. You have to know what your spouse needs from you, and then you do it. And you avoid doing the things that harm the relationship. If your spouse acts the same way, your marriage can make it through anything." A. It's your life + social commentary. B. What you want and what you get are usually two entirely different things. C. No one ever said that life was fair. "Relationships are the most important thing in life, and friends are part of that." Standing next to Micah, I realized that there were times when we talked not because we needed to communicate anything important, but simply because we each drew comfort from the other's voice. When you chase a dream, you learn about yourself. You learn your capabilities and limitations, and the value of hard work and persistence. "Dreams are funny like that. You want something so desperately, you somehow get it, then just as suddenly it's over. Like running races--all that training for a couple of minutes on the track. The secret, I've learned, is to appreciate the process." "...you have to give them both credit for being good parents simply because of the way their kids turned out. We're happily married, successful, ethical, and we remained close as siblings. If your kids can say the same thing later in life, won't you think you did a good job as a parent?" "Work, spirituality, family, friendships, health--you can't ignore any of them or it'll get you in the end." My dad was a good man. A kind man... I...loved him for what he did. He'd foster independence, showed us the value of education, and taught us to be curious about the world. Even more important, he'd helped the three of us become close as siblings, which I consider to be the greatest gift of all. I could have asked for nothing more in a father. And really, who could? Our stories are funny because we lived them, and we survived them. The worse the incident was when it was happening, the funnier the story had become to us over the years. "I tell Ryan that God gave him a brother like Miles so that Ryan could learn that anything is possible and that he can be good at anything. And I tell Miles that God gave him Ryan so that Miles could learn patience and persistence and how to overcome challeges." Life, he decided, was for living, not for having, and he wanted to experience every moment that he could. At the deepest level, he'd come to understand that life could end at any moment, and it was better to be happy than busy. We'd been raised to survive, to meet challenges, and to chase our dreams. … And we don't only love each other, but like each other as well. "One day, you're going to learn something that can't be explained with science. And when that happens, your life's going to change in ways you can't imagine." "My point is simply that kids turn out okay as long as the parents are involved, no matter where they live. It's not like small towns have a monopoly on values. I mean, I'm sure if I did some digging, I'd find lots of kids that were in trouble here, too. Kids are kids, no matter where they live." "I think it happens to everyone as they grow up. You find out who you are and what you want, and then you realize that people you've known forever don't see things the way you do. And so you keep the wonderful memories, but find yourself moving on. It's perfectly normal." She didn't hide what she was thinking, she didn't try to impress him, nor was she swayed by anything he'd accomplished in the past. Instead she seemed to evaluate him as he was today, right now, without holding either the past or the future against him. Love could be set in motion quickly, but true love needed time to grow into something strong and enduring. Love was, above all, about commitment and dedication and a belief that spending years with a certain person would create something greater than the sum of what the two could accomplish separately. Only time, however, could show whether you'd been accurate in your judgment. In her new, more mature incarnation, she embraced the idea that maturity meant thinking about risk long before you pondered the reward, and that success and happiness in life were as much about avoiding mistakes as making your mark in the world. "I'm of the opinion that anyone--even strangers--can sense the urgency of a request, and most people will usually do the right thing. … But when that didn't work, I offered to pay them." Life was about spending time together, about having the time to walk together holding hands, talking quietly as they watched the sun go down. It wasn't glamorous, but it was, in many ways, the best that life had to offer. Wasn't that how the old saying went? Who, on their deathbed, ever said they wished they had worked harder? Or spent less time enjoying a quiet afternoon? Or spent less time with their family? Is love at first sight truly possible? It was like a vacation, one he hadn't planned for, but one that left him feeling more rested than he had in years. For the first time in what seemed like forever, he was choosing the pace of his life rather than his life choosing the pace. Being bored, he decided, was an underrated art form. Does trust have to be earned? Or is it simply a matter of faith? "...but what I eventually came to understand was that if a woman truly loves you, you can't always expect her to tell the truth. You see, women are more attuned to feelings than men are, and if they're not being truthful, more often than not it's because they think the truth might hurt your feelings. But it doesn't mean they don't love you." "...The one thing you've got to remember is to see the big picture. When things get tough, remind yourself why you fell in love with her in the first place. She's a special woman, and you were lucky to find her, just as she was lucky to find you. She's got a heart of gold, and you can't fake something like that." "Well, then I'd say it takes two to tango. My guess is that both of you are right and both of you are wrong. That's the way most arguments go, anyway. People are who they are and no one is perfect, but marriage is about becoming a team. You're going to spend the rest of your life learning about each other, and every now and then, things blow up. But the beauty of marriage is that if you picked the right person and you both love each other, you'll alway figure out a way to get through it." "...What's going on with you two, all this stress you're both under...that's called life. And life has a tendency to throw curveballs when you least expect them. Every couple has ups and downs, every couple argues, and that's the thing--you're a couple, and couples can't function without trust. You have to trust him, and he's got to trust you." "Like I said, you're in this together. Men have certain needs, women have different needs; that's the way it was hundreds of years ago, and that's the way it's going to be hundreds of years from now. If you both realize that, and you both work on meeting each other's needs, you'll have a good marriage. And part of that, for both of you, is trust. In the end, it's that simple." "Kids are people, too, and once they start getting older, they make their own decisions. There's only so much you can do." "...once she becomes a teenager...well, sometimes there's nothing you can do. With or without you, in the end, children grow up to become the people they were meant to be." "...having children changes your life like nothing else. It'll be the hardest and best thing you've ever done." ...suddenly certain that what he was doing now was the sole reason he'd been placed on this earth. To love another. To care for someone else, to help another person, to carry her worries until she was strong enough to carry them on her own. To care for someone unconditionally, for in the end that was what gave life meaning. I fell in love with her when we were together, then fell deeper in love with her in the years we were apart. Our story has three parts: a beginning, a middle, and an end. And although this is the way all stories unfold, I still can't believe that ours didn't go on forever. ...(in the army) you're forced to learn the most important lesson in life, and that's the fact that you have to live up to your responsibilities, and you better do it right. When given an order, you can't say no. It's no exaggeration to say that lives are on the line. One wrong decision, and your buddy might die. It's this fact that makes the army work. That's the big mistake a lot of people make when they wonder how soldiers can put their lives on the line day after day or how they can fight for something they may not believe in. Not everyone does. ...but when all is said and done, we do what we do for one another. For friendship. Not for country, not for patriotism, not because we're programmed killing machines, but because of the guy next to you. You fight for your friend, to keep him alive, and he fights for you, and everything about the army is built on this simple premise. "...good teachers are priceless. They inspire you, they entertain you, and you end up learning a ton even when you don't know it." "Because they're passionate about their subjects." "...when you're struggling with something, look at all the people around you and realize that every single person you see is struggling with something, and to them, it's just as hard as what you're going through." ...She had the rare ability to be exactly what people needed when she was with them and yet still remain true to herself. I knew my dad was a good man, a kind man, and though he'd led a wounded life, he'd done the best he could in raising me. "...I learned that it's possible to go on, no matter how impossible it seems, and that in time, the grief...lessens. It may not ever go away completely, but after a while it's not overwhelming." ...I finally understood what true love really meant. ...that love meant that you care for another person's happiness more than your own, no matter how painful the choices you face might be. Stories are as unique as the people who tell them, and the best stories are those in which the ending is a surprise. It went without saying that he felt guilty about what had happened, but married friends had assured him that guilt was the cornerstone of any good marriage. It meant that a conscience was at work, values were held in high esteem, and reasons to feel guilty were best avoided whenever possible. ...he remembered being very happy. But things change. People change. Change was one of the inevitable laws of nature, exacting its toll on people's lives. Mistakes were made, regrets form, and all the was left were repercussions that made something as simple as rising from the bed seem almost laborious. No pretenses, no attempts to impress, no one trying to show anyone up. Parents might believe themselves to be the bosses, but in the end it was the kids who made the rules. He often felt that too many people lived their lives acting and pretending, wearing masks and losing themselves in the process. That was one of the great things about being single: A person could pretty much do what he wanted, whenever he wanted, and introspection was only an option. Was living together a step toward the future or just a way to continue the present? "Traveling has less to do with seeing things than experiencing them...."
"But I'm different now than i was then. Just like I was different at the end of the trip than I'd been at the beginning. And I'll be different tomorrow than I am today. And what that means is that I can never replicate that trip. Even if I went to the same places and met the same people, it wouldn't be the same. My experience wouldn't be the same. To me, that's what traveling should be about. Meeting people, learning to not only appreciate a different culture, but really enjoy it like a local, following whatever impulse strikes you." "...people are pretty much the same. Especially through adolescence and early adulthood. For the most part, people go through the same experiences and think the same thing, but somehow on one ever escapes the belief that his experience is unique in every conceivable way." "In other words, when the going get tough, the tough get going." "Love is a wonderful thing. It makes life worthwhile. I love being in love." "Spoken like a man with plenty of experience. But keep in mind that true love lasts forever." "Poets would say that true love always ends in tragedy." ...he realized that the same thing that made women initially attractive to him--their need to be taken care of--was the very thing that eventually signaled he end of the relationship. How did that old saying go? If you've been divorced once, you might be right in thinking your ex was the problem. If you've been divorced three times? Well, folks, the problem is most definitely you. Granted, he hadn't been divorced, but the point was well taken. Finding a woman with a sense of humor had been the one piece of advice his father had given him when he'd first begun to get serious about dating, and he finally understood why his dad had considered it important. If conversation was the lyrics, laughter was the music, making time spent together a melody that could be replayed over and over without getting stale. But would she do it differently if she could? She doubted it. Her experiences growing up ad formed her into the woman that she'd become, just as his experiences had formed him, and she didn't regret them. And yet...she knew that wasn't the question that mattered. ...she realized the choice before her was this: Where do I go from here? It is never too late to change things. How far should a person go in the name of true love? Thinking back, he recalled events he wished he could change, tears he wished had never been shed, time that could have been better spent, and frustrations he should have shrugged off. Life, it seemed, was full of regret, and he yearned to turn back the clock so he could live parts of his live over again. One thing was certain: He should have been a better husband. He wasn't sure; capturing a specific instant like that was no more possible than locating a specific drop of water in the ocean. These days, it seemed that the only thing he was certain about was the knowledge that he wouldn't trade his years with Gabby for anything. Without her, his life had little meaning. He was a small-town husband with a small-town occupation and his cares were no different from anyone else's. He'd been neither a leader nor a follower, nor had he been someone who would be remembered long after he passed away. He was the most ordinary of men with only one exception: He'd fallen in love with a woman named Gabby, his love deepening in the years they'd been married. But fate had conspired to ruin all that, and now he spent long periods of his days wondering whether it was humanly possible to fix things between them. Marriage, each of them realized intuitively, was about compromise and forgiveness. It was about balance, where one person complemented the other. You're doing the best you can, right? Isn't that what we always tell each other? He loved his wife but hated what life with her had become, cursing himself for even thinking this way. The past was gone and the future had yet to unfold, and he knew he should focus his life on the present...yet his day-to-day existence suddenly struck him as endless and unbearable. ...He was with the woman and daughters he loved, and who could ever need or want anything more than that?...It was just a normal day, a day like any other. But most of all, it was a day in which everything was exactly the way it should be. "...There is a greater purpose to all this. It is your destiny." ...she was struck by the simple truth that sometimes the most ordinary things could be made extraordinary, simply by doing them with the right people. Life, he realized, was much like a song. In the beginning there is mystery, in the end there is confirmation, but it's in the middle where all the emotion resides to make the whole thing worthwhile. "That's what courage is. If she weren't scared, she wouldn't need courage in the first place." "...people who are grieving have to want to move on--that first step, that motivating spark, has to come from within them. And when it does, it opens the door to the unexpected." "Love doesn't mean anything if you're not willing to make a commitment, and you have to think not only about what you want, but about what he wants. Not just now, but in the future." "I just tell people what they already know but are afraid to admit to themselves." "I'm not sure anyone's life turns out exactly the way they imagine. All we can do is to try to make the best of it. Even when it seems impossible." "Maybe I don't want to be defined by what I do. Maybe I'd like to be defined by what I am." "Long-term relationships--the ones that matter--are all about weathering the peaks and valleys." "Dying is a strange business, and I'm not going to bore you with the details. I might have weeks or I might have months and though it's a cliche, it's true that so many of the things I once believed to be important no longer are. ...I find myself reflecting on the essential moments of my life." Katie eventually realizes that she must choose between a life of transient safety and one of riskier rewards...and that in the darkest hour, love is the only true safe haven. He knew that Amanda would always be the very best part of him, the self he would always long to know. It was a life, she eventually concluded, that had been lived in the middle ground, where contentment and love were found in the smallest details of people's lives. It was a life of dignity and honor, not without sorrows yet fulfilling in a way that few experiences ever were. She knew Tuck understood that more than anyone. ...he had the sense that they were both lonely, albeit in different ways. He was a solitary figure in a vast landscape while she was a face in a nameless crowd. ...the grass isn't always greener on the other side. What the younger generation didn't understand was that the grass was greener where it's watered, which meant that both Frank and Amanda had to get out their hoses if they wanted to make things better. "...even then I knew that I was fortunate. Because you were the first guy who wasn't constantly trying to impress me. You accepted who you were, but more than that, you accepted me for me." "You have to understand that I'm not the girl I used to be. I'm a wife and a mother now, and like everyone else I'm not perfect. I struggle with the choices I've made and I make mistakes, and half the time I wonder who I really am or what I'm doing or whether my life means anything at all. I'm not special at all, Dawson, and you need to know that. You have to understand that I'm just...ordinary." Love, after all, always said more about those who felt it than it did about the ones they loved. The past was gone, after all, and the future was the only thing they had left. ...there'd also been an unvarnished honestly in what they'd said. There were no hidden meanings, no secret attempts to pass judgment; as quickly as their disagreements had flared up, they'd pass. But trust me when I say that memories are funny things. Sometimes they're real, but other times they change into what we want them to be... But like I said, she's hurting, and if there's one thing I've learned, it's that people in pain don't always see things as clearly as they should... And if it somehow doesn't work out between you, then you've got to understand that you can't look back anymore. It'll destroy you in the end, and destroy her as well. Neither one of you can keep living with regret, because it drains the life right out of you, and the very idea is enough to break my heart. "...I said everything that matters... Don't take my advice. Or anyone's advice. Trust yourself. For good or for bad, happy or unhappy, it's your life, and what you do with it has always been entirely up to you." I sometimes think to myself that I’m the last of my kind. His voice, even now, follows me everywhere on this longest of rides, this thing called life. "Sophia waited for the joke, but it didn't come. "You call your horse 'Horse'?" "You should give him a noble name. Like Prince or Chief or something." "It might confuse him now." "Trust me. Anything is better than Horse. It's like naming a dog Dog." "I have a dog named Dog. Australian Cattle Dog." He turned, his expression utterly matter-of-fact. "Great herder." "And your mom didn't complain?" I had never dreamed of being a soldier; I had never fired a gun. I was not, nor ever had been, a fighter of any sort, but even so, I loved my country, and I spent much of that year trying to imagine a future distorted by war. "As your father used to say, we shared the longest ride together, this thing called life, and mine has been filled with joy because of you." The words nearly break my heart, and I feel something crumble inside me. The truth is often a terrible thing, and I wish again that I were someone else. But it is too late now, too late to change anything. I am old and alone and I'm dying a little more with each passing hour. I'm tired, more tired than I've ever been. While she was exceptional, I was average, a man whose major accomplishment in life was to love her without reservation, and that would never change. "It was the way you looked at me while I looked at the art that changed me. It is you, in other words, who changed." I liked this about her. I liked the mystery she added to my life. I liked the occasional silence between us, for ours was a comfortable silence. It was a passionate silence, one that had its roots in comfort and desire. In this world, after all, I've become more or less invisible...I've become what the young are afraid of becoming, just another member of the nameless elderly, an old and broken man with nothing left to offer to this world. My days are inconsequential, comprising simple moments and even simpler pleasures. I eat and sleep and think of Ruth; I wander the house and stare the the paintings, and in the mornings, I feed the pigeons that gather in my backyard. My marriage brought great happiness into my life, but lately there's been nothing but sadness. I understand that love and tragedy go hand in hand, for there can't be one without the other, but nonetheless I find myself wondering whether the tradeoff is fair. A man should die as he had lived, I think; in his final moments, he should be surrounded and comforted by those he's always loved. "You are a smart man, Ira, but sometimes I think you do not understand women very well." I was not meant to be alone. I am not good at it. The years since Ruth's passing have ticked by with the kind of desparate silence known only to the elderly. It is a silence underscored by loneliness and the knowledge that the good years are already in the past, coupled with the complications of old age itself. A truth emerges in any long marriage, and the truth is this: Our spouses sometimes know us better than we even know ourselves. "I wish I had the talent to paint the way I feel about you, for my words always feel inadequate. I imagine using red for your passion and pale blue for your kindness; forest green to reflect the depth of your empathy and bright yellow for your unflagging optimism. And still I wonder: can even an artist's palette capture the full range of what you mean to me?" "My plea to you is this: despite your sadness, do not forget how happy you have made me; do not forget that I loved a man who loved me in return, and this was the greatest gift I could ever hope to receive." She believes in me and I can be anything I want when I grow up. I can even change the world." "'If there is a heaven, we will find each other again, for there is no heaven without you.'"